LOS ANGELES – Registration is now open for the 2019 Greater Los Angeles Homeless Count, which will take place January 22-24. The Los Angeles Homelessness Services Authority (LAHSA) needs more than 8,000 volunteers to canvass more than 80 cities and 200 communities across Los Angeles County. The Greater Los Angeles Homeless Count is the largest homeless census count in the nation and coordinated locally by the LAHSA. Over the course of three days and nights, thousands of trained volunteers fan out across the LA region to determine how many homeless individuals and families there are in the area, identify their demographic characteristics and the locations where they reside. This data is essential to help LAHSA advocate for and allocate resources where they will serve the greatest needs. The Homeless Count is a community-wide undertaking made possible only with the support of dedicated volunteers, partners, civic leaders, law enforcement and elected officials. It is a strong demonstration of the shared mission to end homelessness in Los Angeles. 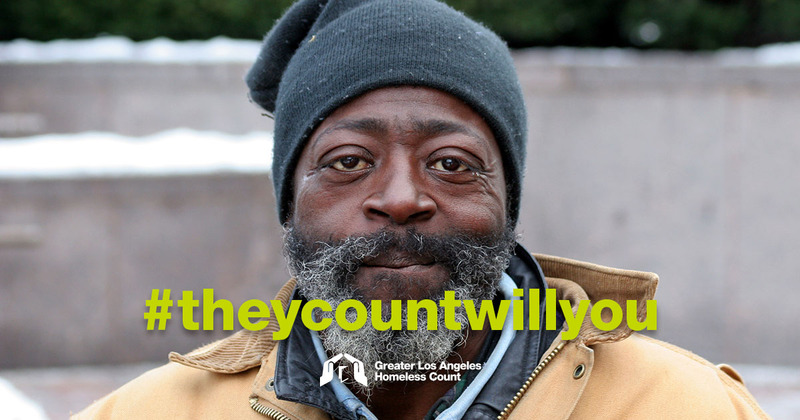 By participating in the Homeless Count, you will help the city better understand homelessness in our region and direct resources where they’re needed most. Sign up today to volunteer at www.theycountwillyou.org.